Located in Pratunam, Bangkok, The Platinum Fashion Mall is a wholesale and retail shopping mall that specializes in fashion clothes and accessories. 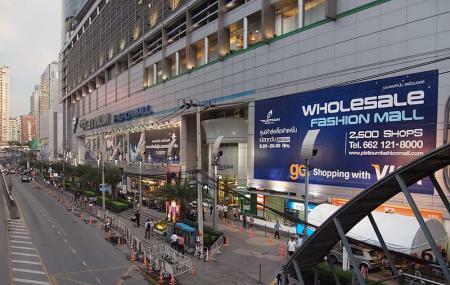 The mall is spread over six-storey and 47,000 square-meter space and is one of the most favourite shopping malls in Bangkok. There are over 2500 shops here that update their products weekly. Products include men’s and women’s apparel, fashion shoes and bags, beauty cosmetics, fashion accessories, children’s wear, gift-shops, and miscellaneous items. Customer services at the mall include Food Centre, located at the 6th floor that provides more than 100 food options to choose from; Banking service by Bangkok Bank, Thai Commercial Bank, Thai Farmer Bank and more; Muslim prayer hall; Cargo service centre for domestic and overseas delivery. The Platinum Fashion Mall is not one of the most important things to do in Bangkok like Wat Pho Reclining Buddha, B T S Skytrain, Rajawongse Clothier, Grand Palace and Wat Phra Kaew. Most of the Bangkok tours skip a visit to this place, but you can create your customized plan if you wish to visit The Platinum Fashion Mall. Find the joy in planning a D.I.Y. trip by using this awesome Bangkok trip planner. Oomph up your visit by adding the best hotels in Bangkok like Pas Cher Hotel De Bangkok, Ibis Bangkok Riverside, Kokotel Bangkok Surawong and Marvin Suites. Explore the best Bangkok vacation packages that will take to you important landmarks of the city! For getting in, check out how to reach Bangkok. How popular is The Platinum Fashion Mall? People normally club together Bangkok Doll Factory And Museum and Toy Kuay Teow Reua Boat Noodles while planning their visit to The Platinum Fashion Mall. The Platinum Fashion Shopping Mall is one of the best place for shopping. You find a different varieties of men and women clothes, shoes, leather bags, luggage, money bags, belt etc. within buying limit. You will also get the running shoes with a comparatively less price. It has two complex, one is renowned for women clothes, jewelry, leather items such bags etc. Another one is renowned for baby dress and relevant baby items. Different types of shoes for both men and women. But you hardly get any electronics & mobile accessories from here. It's only for clothes, bags and shoes. One important thing I want to focus, don't forget to taste the sweet mango sticky rice from any dessert shops from here! Happy shopping!! Great for wholesale/ bulk buy (clothing). There are many stalls offering the same product- my recommendation is to: 1. Go through different stores and note the price of the products you want 2. Have a walk through so you can see if there is any other store offering the same products at lower price 3. On Sunday, you can buy single piece for whole sale price If you go there with a trolley, the sellers will assume that you want to buy for resell, they may offer you a better price. I guess, this is a shopping paradise for the female colleagues with me on a holiday trip to Bangkok. As for the guys, some loved it as well and as for me, I preferred to just sip coffee somewhere and enjoy people watching, which I did. But from the reaction from the ladies, I believed they have got some really good deals. The mall is huge with many levels and I cannot even remember how many are there altogether. I just remembered walking just one floor and got tired of it. But to be fair, I still believe that it’s a good place for shoppers, just that it’s not my cup of tea. This is like a shopping heaven especially for the ladies!! They have 2 different buildings and there is a connecting bridge at level 2 (I think?). The floors are separated to clothes' floor, bags' floor and shoes' floor. Take note that the clothes cannot be tried on but they do have changing room in the bathrooms just in case you would like to change the size after paying. There are also many hawker stalls outside which sells good food like squid, prawns and coconut drinks. Immensely popular with locals and tourists. Sheer quantity of stalls over 3 zones / buildings selling similar products but different designs of apparel for men, women and children is staggering. A wholesale location where you can get a good buy if you can buy a few more pieces. Hardly can find any repeats walking from stall to stall... The trick is to consolidate purchase quantity with family or friends to get a good bargain price.